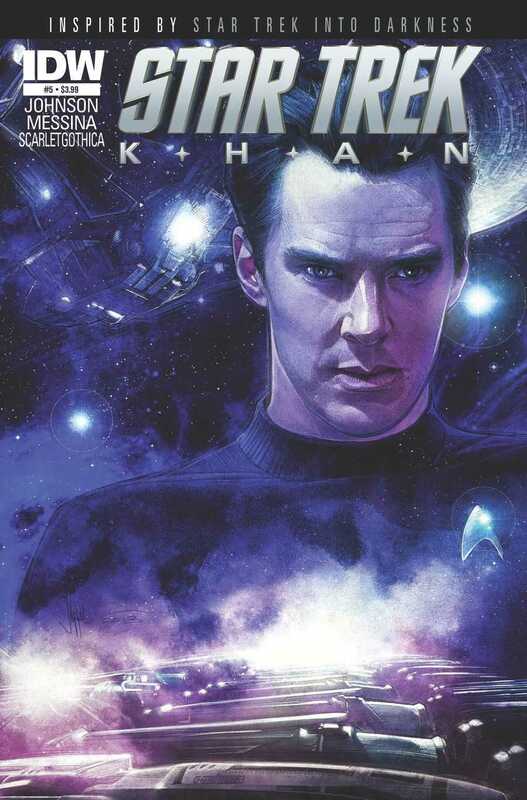 Up until now we have seen all of Khan Noonien Singh’s origins. From when he was a street urchin in India to how and when he was drafted in a program to “improve” the human race through genetic manipulation andwhat not. He became a world conqueror alongside his siblings and eventually he was forced to leave Earth because the situation got far too untenable for him and his people to continue living on the planet. And then we saw how he was “picked” up by Admiral Marcus and then the whole events of Star Trek: Into Darkness followed. Now we get to the final conclusion of that story and everything comes full circle now. But, it is not all that it is cracked up to be, largely because there is so much damn exposition in this issue. The issue lays everything out. We are told the whole damn story and it felt like this issue was double-sized. It never seemed to end really, and it kept going on and on. It was kind of fun to see Khan’s journey to that point, but I just could not get into it at all. Thing is, I was beyond caring. I read this issue largely out of a sense of completion. I didn’t want to leave off with this story at this point. I had invested myself and I wanted something, no matter how small, out of it. That’s really it. It was a mere formality for me. And given the levels of exposition, to the tune that the entire issue is just talking heads in almost every panel, the whole effect was just ruined. When this series started, it had some great potential but in the last two issues we have seen that potential squandered and wasted. And I’m very disappointed I have to admit. I wanted to like this story so much, but I just couldn’t. And I tried. The art, well, it is nothing to speak home about. Absolutely no improvements from the last two issues, and I was just bored. When you have an issue that is so boring on a narrative level, and so boring on an art level, it is doubly hard to like it. And that’s what I felt like here. It is significant that this is the shortest comics review I’ve written, because I just don’t have any more words that I can add. I just can’t bring myself to care enough to continue talking about it. More Khan: #1, #2, #3, #4. Posted on February 19, 2014, in Comics Reviews, Review Central and tagged Claudia Balboni, Claudia ScarletGothica, Comics, Comics Review, David Messina, IDW Publishing, Khan, Khan Noonien Singh, Marina Castelvetro, Mike Johnson, Neil Uyetake, Review, Review Central, Science Fiction, Space Opera, Star Trek, Star Trek: Into Darkness, Star Trek: Khan. Bookmark the permalink. 3 Comments.